I know this is late getting on here, but I've had major brain freeze. No thoughts or ideas could penetrate the thick fog that filled my gray matter. But I'm trying to get out of my mindless funk and get back on track. I've even come up with a new idea for New England Bites that I hope to share with you in the coming weeks. In the meantime, let's get to this long overdue review. We had just come out of the "cheap show", a theater in East Providence where you can still see a movie for $2.50. Starved, as usual, we headed right across the street for Uncle Tony's, a very popular and busy pizza and pasta place. In fact it was so busy all the parking in front of the restaurant was taken and we had to park in their spare lot across the street. 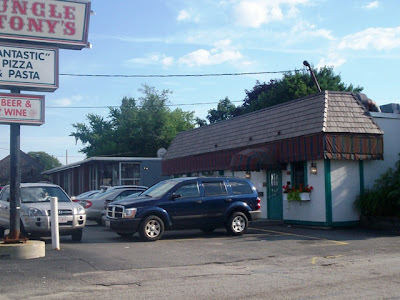 It was 4:45 p.m.
Now we've been to Uncle Tony's before but had never done a review. Today was the day! We entered and found ourselves in the take-out area. We stood around and waited to be seated ... and waited ... and waited. People were rushing by us but no one spoke to us or gave any indication that they would any time soon. It was uncomfortable to say the least. The worst part was that there were about five or six people working in the take-out area but they did not approach us either. They just kind of stared at us as we stood and looked around helplessly until Laura noticed a sign in the next doorway that read 'please wait to be seated'. Are you kidding me? No one could tell us we were standing in the wrong spot. I was mad. 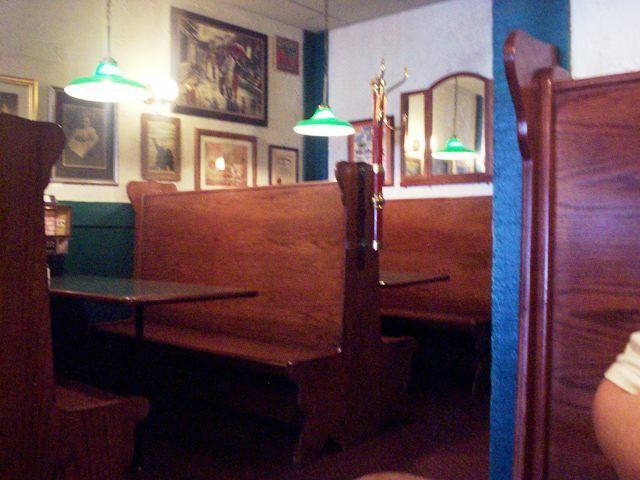 A frantic waitress finally noticed us and quickly took us to a back booth. Not the best seat in the house but it would do. Hmmm, the booth was a bit uncomfortable but hopefully the food was great and we'd forget all this nonsense. Now I didn't know if this was good or bad but Laura and I had been here before, as I mentioned, and we couldn't remember what the food was like. Did we like it, or not? Church pews ... er ... booths. It didn't take long before we were approached by our server, Gail. She brought us menus and took our drink order - two Diet Cokes. This was a huge menu. Besides their many varieties of pizza, with just about any topping you can think of, including salami, hot capicola and roasted red peppers, they also carry a large selection of specialty pasta dishes. You can get spaghetti, ziti, ravioli or fettuccine with a myriad of accompaniments like meat sauce, peppers, veal cutlets, sausage, eggplant and much more. If you want your pasta with seafood you can get red or white clamsauce, shrimp or scallops. They also have manicotti, lasagna, baked pastas, stuffed peppers and baked scrod among many main dishes. They carry hot oven subs with most of the toppings you get on their pizzas. And for appetizers you can get fried calamari, crosstinni, antipasto and wings, fingers, poppers and much more. They also have a light luncheon menu with pasta specials, salads and wraps. 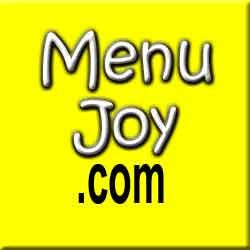 A full service catering menu is also available. To get the full scope of all they offer click onto their website (above). When Gail came back with our Cokes and some good Italian bread, we gave her our order. 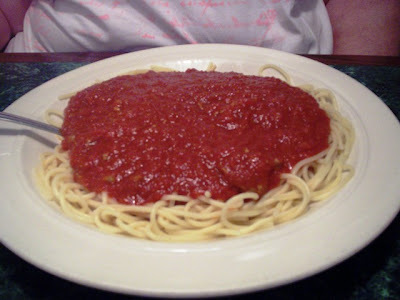 I decided to get spaghetti with meatsauce. This is my favorite pasta dish and I've gotten it in almost every Italian restaurant we've been to. But I must say, I was a little disappointed with this version. The sauce was very thin and watery and the meat hard to find. The worst thing, however, was the spices or lack thereof. I saw no sign of any spices in the sauce, no parsley flakes, no oregano, no pepper flakes and no garlic. It was so bland. I was very disappointed. Laura went with her favorite thing in the whole world, pizza. Specifically an Al Pesto pizza. 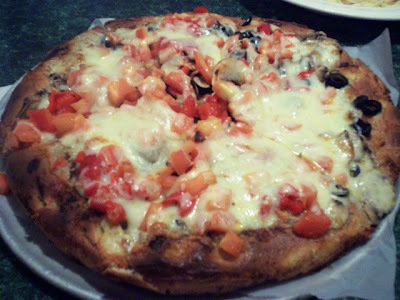 It consisted of fresh tomatoes, roasted peppers, mushrooms, black olives with olive oil and pesto sauce and mozzarella cheese. 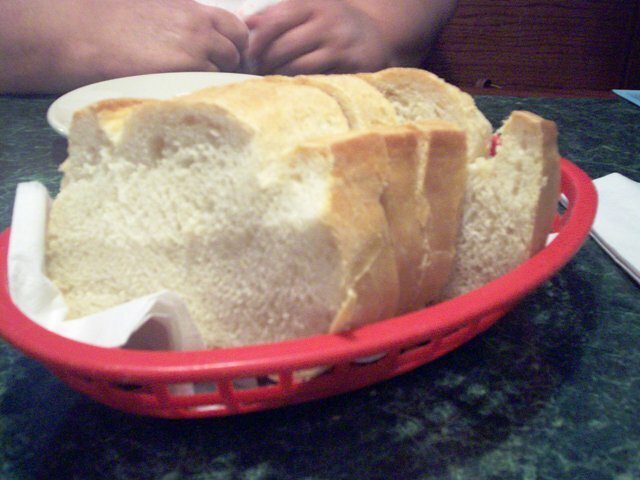 It was baked on a thick rustic dough. And that dough was predominant in this pizza. It was so thick and puffy that everything else kind of got lost. Laura had the same complaint that I had. There were no spices perking up her pie. Even with all those great ingredients on top, there was not a great deal of flavor. Strange. She took most of the pizza home and really didn't look forward to it the next day. That is VERY unusual for her. VERDICT: I wouldn't rush back here. I know they have their legion of fans, but I guess we've just been spoiled by other Italian restaurants that had more authentic food. This food seemed to have toned down any spiciness to perhaps cater to a more American palate. If that sounds snobby I don't mean it to be. I'm just not used to having bland Italian food. With a 20% tip for Gail, we left $27 on the table. 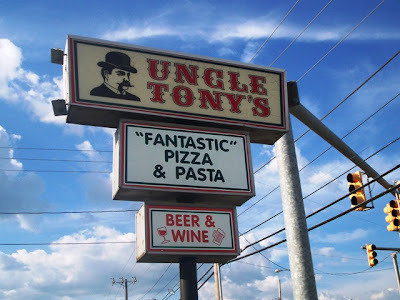 Uncle Tony's Pizza and Pasta in East Providence is open from 11:30 a.m. to 10 p.m. Monday through Thursday, 11:30 a.m. to 10:30 p.m. Friday, and 12-11 p.m. on Saturday and Sunday.